Brand identity and collateral and website development for real estate property. The former Thomas Greenwater Treatment Facility located between the 2nd Street Retail District and the Seaholm Power Plant is set to be the new home of a 4.4 acre commercial and residential real estate development. After earning the exclusive right to purchase and revitalize the property, the Block 1 development team approached MODintelechy to create an impactful brand for the structure that would entice the interest of the public to take advantage of this unique opportunity. To start the brand development process, the first goal was to name the multi-million dollar residential high-rise that would soon be under construction in Austin’s emerging 2nd Street District. Given the property’s rich history, we had no shortage of inspiration when it came to developing a name that would speak to both the property's history as well as the target market. After an extensive research phase, we were able to develop several naming options. Using The Northshore as the development’s official name, MODintelechy delved into the process of creating the property’s brand identity, beginning with logo design. Upon rounds of direction exploration, color palette selections, and design refinements, the Northshore team was thrilled with the final logo that spoke to both the property’s proximity to Lady Bird Lake, as well as the classic and elegant look of the future structure. 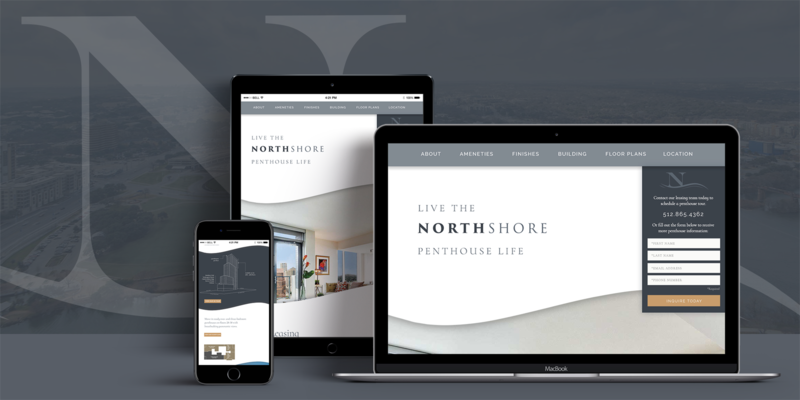 To help the property generate interest around the upcoming start of leasing, we developed marketing materials aligned with The Northshore's new brand identity. Construction site signage with leasing information peaked curiosity around the upcoming residential and commercial property, as well as elevator panels and the future tower’s exterior signage. On the digital front, we designed a website with images depicting the property’s amenities and prime location to popular Austin hotspots. 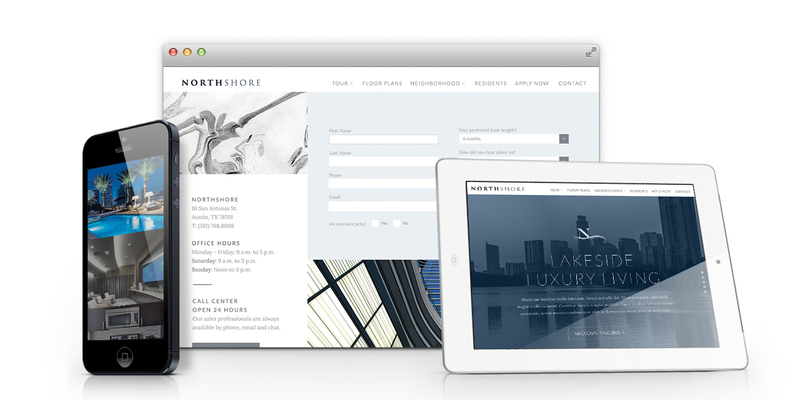 After successfully building a strong brand identity and web presence, next was creating a targeted marketing program promoting the availability of the 44 penthouse units. Our campaign centered around living “The Northshore Penthouse Life”, highlighting the homes’ incredible downtown and Town Lakes views and proximity to the bustling 2nd Street District as well as the penthouse-specific amenities. Furthermore, Northshore represents a rare leasing opportunity with more penthouse units than any other downtown residence. In order to promote the available homes, we crafted a direct mail campaign targeting three niche demographics, developed a lead-generating penthouse specific landing page, and strategized guerilla marketing tactics to garner media attention and attract interest. "Given the property’s rich history, we had no shortage of inspiration when it came to developing a name that would speak to both the property history as well as the target market." With MODintelechy’s expertise in brand identity development and collateral and website design, this downtown Austin high-rise is quickly becoming one of the most buzzworthy residential and commercial real estate opportunities in the 2nd Street District.